Moving into a new home is an exciting time. As for all the preparation involved, maybe not as exciting. But it doesn’t have to be stressful. Follow some of these smart organisational tips before you get packing. Get a floor plan of your new abode. If you’re unable to access one through your real estate agent, simply create one yourself using a free online tool like Autodesk Homestyler. Or, design your own blueprint by taking photographs and getting measurements of all the new rooms, ensuring you capture the heights of the ceilings and windows, along with the dimensions of cupboards and pantries. Once you know how much space you have to work with, it’s best to begin clearing your home of the things you no longer need or want – before you begin packing. This is a great way to start fresh in your new home, while ending the cycle of clutter. This will also make the process of packing easier and more efficient. You can ease the stress of weeding through items by taking it one room at a time. For each space, you’ll want to determine what to keep, donate, sell or throw away. Create separate piles for each. While weeding through kitchen accessories, it’s important to remember the amount of cupboard space your new home has, to help you to determine what you’ll take and what you’ll get rid of. Chucking or donating any homewares you have multiples of is always a good idea. How many cake tins or plastic takeaway containers do you really need? Broken appliances you’ve never gotten around to fixing can go too. When it comes to sorting food from your pantry, freezer or fridge, make it a priority to plan as many meals as you can, using up the edibles you have. This will take some weight out of your packing, and reduce the risk of spoiling. Holding back from supermarket sprees in the weeks leading up to your move will also help. What to do with what’s leftover? Canned goods are a bit weighty to move, and can take up more space than you have. So, you might prefer to donate these. Otherwise, any unopened, pre-packaged items or dried goods can go with you. Just be sure to check the expiration dates on everything, before you pack. Knowing how much furniture your future living room can hold is always helpful when determining which furnishings to move and which to donate or sell. 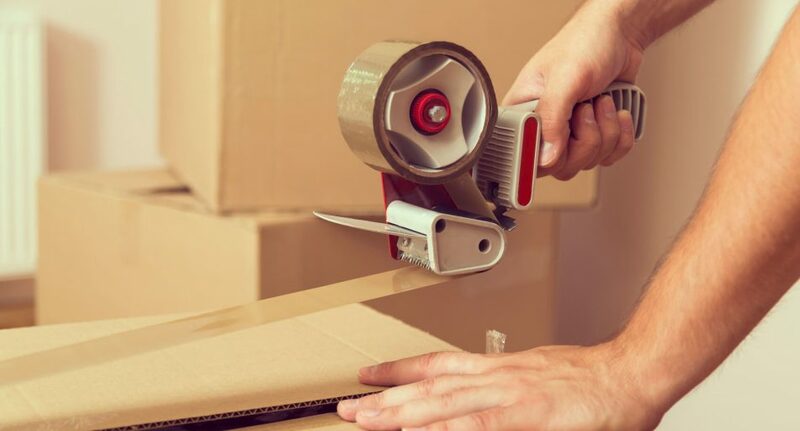 Once you’ve made those decisions, begin disassembling furniture well in advance of the move, while you have the stamina and spare time – because this takes a lot of both! Begin by dismantling removable parts such as legs, frames, doors and tabletops, and put the hardware (nuts, bolts, etc.) in labelled plastic bags. These can then be taped underneath the item. If the piece itself has numerous parts, it helps to number each part using a labelling sticker that indicates part: 1 of 6, 2 of 6 and so forth. Paperwork can be a big source of clutter. Worse, it can be hard to know what to keep and what to throw out. The Australian Taxation Office recommends hanging on to the past seven years’ worth of tax-return documents, bank statements and pay stubs. But if you’re feeling uneasy about shredding anything older than that, you can always scan and save documents, digitally. Newspapers and magazines can also take up more space than we realise. Ditch anything over a month old. Don’t be afraid to tear out articles to read later, or scan them. Moving is also a great time to back up your computer files and photos using a cloud storage service or external hard drive. When moving you risk damaging items, including computers. So, it’s smart to protect any digital items you don’t want to lose. Sorting through a bedroom’s dresser and wardrobe can be a daunting task. How do you know what to keep and what to donate, sell or throw away? Keep in mind anything with stains and tears serves better as a cleaning rag than donation. Any expensive fashions that are still in good shape might get you some extra cash by putting them on online classifieds like Gumtree or eBay. The key to effectively clearing out closets, the garage or other general storage spaces is remembering this rule of thumb: If you haven’t used an item in years, there’s probably no point in moving it to your new space. Naturally, you may uncover items of sentimental value. Think shoeboxes of travel mementos and family heirlooms, which can be emotionally difficult to downsize. If this is the case, ask yourself if the item is the best symbol of that memory or person you received it from. This thought process can help you offload any “multiples” you have of past experiences or people. Once you’ve cleared out the clutter, you’re ready to begin packing all the items you do need to make your new house a home. But before you head to your new abode, remember to insure your things against damage or loss during the move. What cars have ISOFIX in Australia?